As the BW is used, small fibers from the yarn get inside the unit. Yes, they actually get inside the internal gears of the Ball Winder and start to accumulate. You can see these fibers on your work table or on the top of the BW itself. As time goes on, the BW gears pack and compress these fibers into the crevices of the gears. Everything still works but slowly but surely the handle gets harder to turn and you may see evidence of the ball changing in subtle ways. Eventually, the dreaded Wonky Ball is seen. Ouch! A Wonky Ball is one which is mis-shapened and either forms the "rings of Saturn" or the yarn goes over the top or under the bottom of the ball. It could also start to form along a slanted angle on the spindle. Panic sets in and the user struggles to find out what is happening! They may end up adjusting everything, all to no avail. They then do it again and again while they get more frustrated and upset! So what is causing these Wonky Ball Problems anyway? The BW is designed to run in such a way that it has no restrictions of any type. We want everything to run smoothly and without TENSION being added by the unit itself. Although we want some tension on the yarn, we want the user to be in complete control of that tension by means of the Curly Q on the top of the 8" post. All other mechanical parts of the system should do a specific job of turning and spinning freely. As time goes on and these components within the system either get clogged with fiber or start to wear in (or out) or get adjusted by the user or are affected by climate, etc., etc. then things can and do change. The good news is that these are all adjustments that the user can make (or maintenance functions that they can do) themselves! The most important adjustment that the user will make over the lifetime of the BW is setting the O-ring tension on the Ball Winder's Flange. 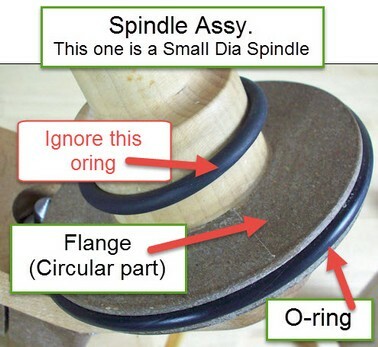 The flange is the large circular part at the base of the Spindle. See picture on right. A video link is provided that will show you how to adjust the O-ring tension. Look for "How to Clean the Heacy Duty Ball Winder" and also "O-ring Adjustment #2"